LAS VEGAS, October 9, 2017 — Exhibiting for the first time at the NBAA Business Aviation Convention and Exhibition (NBAA-BACE), AeroTEC is pulling out all the stops to showcase its robust test, engineering and certification capabilities to the global business aviation community. One highlight of the company’s exhibits (C13225 and C13338) will be a 39-foot, $1.58 million mobile telemetry lab staffed by a team of engineering experts available to guide and answer visitor questions about the company’s work and capabilities. With locations in Seattle (engineering), and Moses Lake (flight test), Washington, the company has grown from 20 to 400 employees since 2015, largely due to its role in the Mitsubishi Regional Jet (MRJ) flight test and certification program, according to President Lee Human. 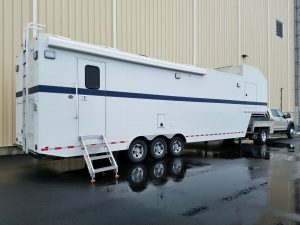 In addition to the mobile telemetry trailer, which enables AeroTEC to travel anywhere in North America for optimal flight test conditions, AeroTEC is building a second, 32,000 square-foot narrow-body hangar in Moses Lake. The new facility, which is slated to open next month, will complement the existing 68,000 square-foot wide-body facility. At the same time, the company continues to enhance existing capabilities such as rapid prototyping and manufacturing, CNC machining, composites and special test equipment fabrication such as advanced wind tunnel models, artificial ice shapes, trailing cone systems, and load banks.